I have discovered sushi only in recent years. Growing up in Italy, it wasn’t something I had great exposure to. Now Japanese food (and sushi above all) has become very popular in Italy, but it is really expensive. Australia instead is full of sushi bars and amazing Japanese joints, so eating sushi has become much more accessible to me. If you know Manu’s Menu though, you will also know that when I like something, I always try to recreate it at home. I love being able to “conquer” new dishes and cuisines. 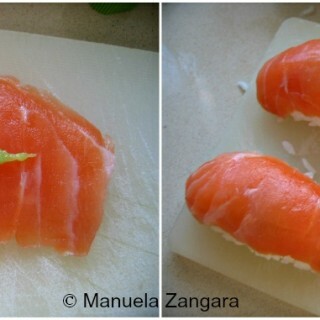 So a little while ago I made my first sushi rice and I shared with you the recipe for my Spicy Tuna Salad Sushi Roll. It was a success, so I decided to keep experimenting. 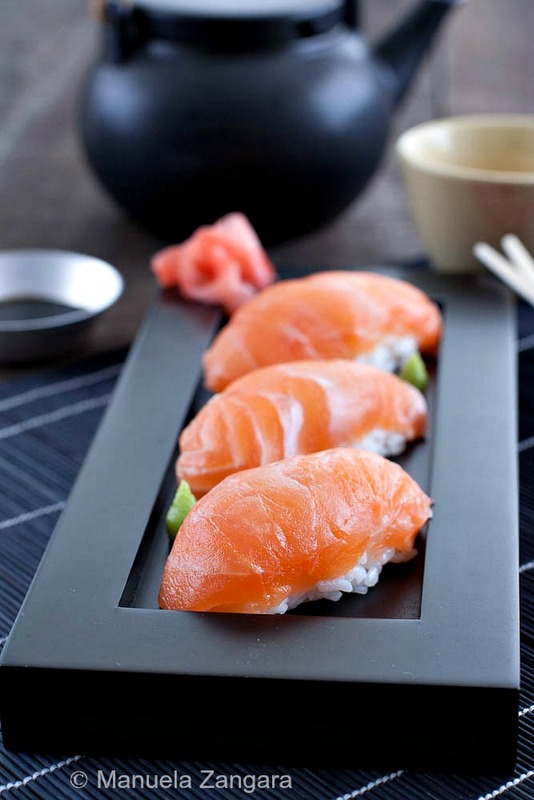 Salmon Nigiri is something I always order when eating sushi. It is one of my favourite! So… here goes my version! 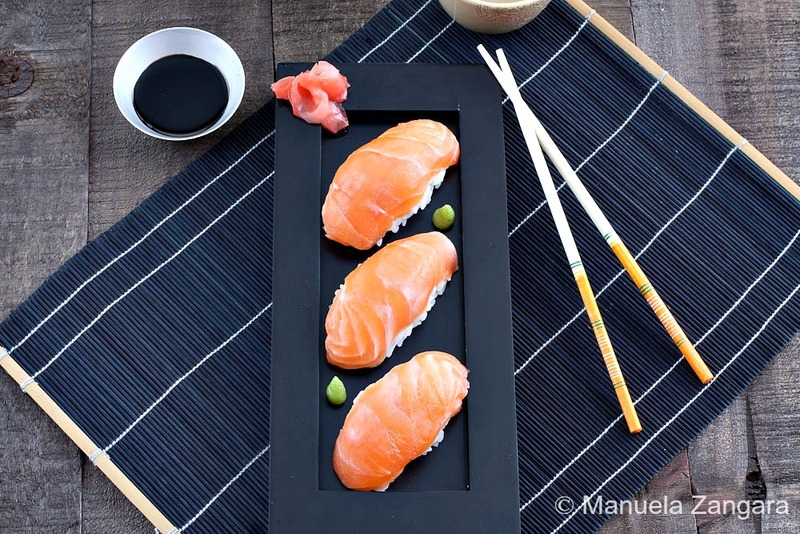 You won’t belive how easy it is to make your own: all you need is seasoned sushi rice, wasabi and VERY FRESH salamon… that’s it! Enjoy! 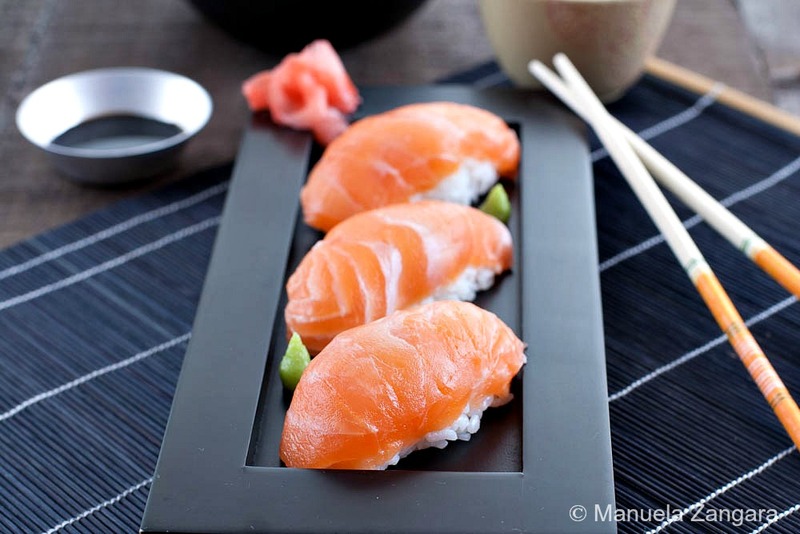 How to make your own Salmon Nigiri, sushi rice included! Wet your hands and shape the seasoned rice into 10 quenelles. Put a little wasabi on each slice of salmon and then put them on top of the shaped rice so that the wasabi “sticks” it to the rice. Press well with your hands to shape it. Serve immediately with soy sauce and pickled ginger on the side. Always buy sushi/sashimi grade salmon to eat raw and please be careful. Consuming raw fish may increase your risk of foodborne illness, especially if you have a medical condition. Do so at your own risk. Ask your fishmonger to slice the salmon for better results. Oh gorgeous! 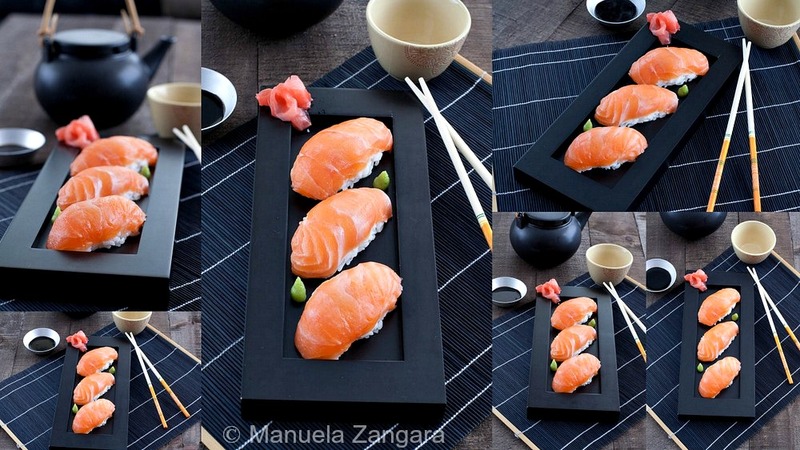 I can make maki – and love to – but just can’t get a beautiful nigiri like yours. Funny, I took a sushi class with my son a couple of years ago and he was the only one that could make these. I am in awe of yours…. I have to try now.